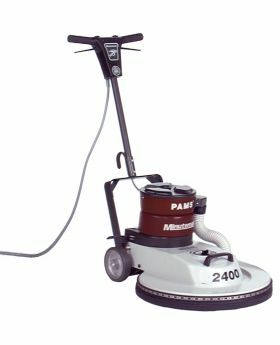 The Minuteman 2400 Electric Burnisher Series offers the option to include Passive Air Management System (PAMS). This option reduces the need for dust mopping and high level dusting considerably. The 2400 Electric Burnisher Series comes standard with a carbon brush indicator that notifies the user service is required. Features a 20 inch brush diameter and a 1 1/2 hp horse power and your choice of brush speed of 2400 or 1500 RPM.